This morning, Jerusalem’s largest supermarket was swarming with at least 500 costumers. I don’t have a car and they don’t do deliveries, so I only brave the crowds there twice a year to pick up frozen kreplach* before Yom Kippur and Purim. In Israeli supermarkets, customers need to insert a 5 NIS coin when they take a shopping cart, which they get back when they return the cart. But I didn’t take a shopping cart, since, yanno, all I needed were kreplach. But, I guess I forgot that I am, yanno, a woman and mother in Jerusalem’s largest and cheapest supermarket, and within minutes my arms were full of more stuff than I could possibly carry. But the shopping carts were all the way outside, so I asked a man at the check-out if I could give him 5-shekels for his now empty cart. But he needed the cart, he said, to get his groceries to his car. And then I turned around and saw an empty shopping cart, just standing there next to the check-out. I figured it was one of those broken carts without a 5 shekel thingamajig which are always floating like ghosts around Israeli supermarkets. So I took the cart, threw my stuff into it, and picked up 50 hair elastics and a 2-kilo bag of bisli for 10 NIS each as well as 100 granola bars for 49.99. And then I saw them. How had I not noticed them before? The front section of my shopping cart was set apart with a piece of red plastic, and I hadn’t noticed the 6-pack of beer and package of freezer bags sitting in front of it. In my shopping cart. No, NOT my shopping cart. Three days before Yom Kippur. On my way to buy kreplach for my family’s seudat mafseket. I, Chana Jenny Weisberg, was pushing around a stolen vehicle. My mind raced around, trying to figure out what to do…At least 20 minutes had passed since I’d taken the shopping cart, the cart’s owner could be anywhere in this swarming, football-field-sized supermarket. There was no way to return the 5 shekels I had inadvertently stolen. A sickly feeling fermented in my soul. And that sickly feeling followed me from the candy aisle to the chips aisle to the freezer section. What an awful way to go into Yom Kippur. And then suddenly, for some reason I don’t remember, I looked down at the shopping cart. At the 5-shekel thingamajig. And would you believe that it was EMPTY. This actually was one of those broken shopping carts, as I had originally thought. From one second to the next my crime had evaporated, been washed away! Like muddy footprints that disappear completely in an autumn rain. And I realized at that moment that what I had just experienced would be repeated around the world just a few days from now. Each one of us, looking down, certain of our crimes, only to have them washed away in this autumn rainstorm of love and mercy. Yom Kippur. 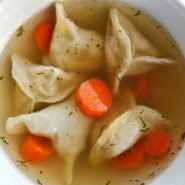 * Kreplach are meat dumplings (think kosher wontons) eaten traditionally before Yom Kippur, and on Hoshana Raba and Purim. Superb! I tottally relate to your experience and insight. Inspiring, practical, down to earth and spiritual at the same time.